You may have noticed a plethora of Lemonade signs throughout Los Angeles, not lemonade stands, but a modern, fast-casual, cafeteria-style restaurant. The co-founder, Alan Jackson is the grandson of the 50s and 60s actor Alan Ladd. His mother is Ladd’s daughter and his father is legendary Los Angeles talk show radio host, Michael Jackson. Instead of following his family’s entertainment footsteps, Alan Jackson made a name for himself in the restaurant and hospitality industry in Los Angeles. At the age of twenty, he started cooking at the prestigious Bel Air Hotel. Later, he opened the restaurants Jackson’s and The Farm in Beverly Hills. Along with a successful catering company, he opened his first Lemonade restaurant in West Hollywood in 2007. Since then, Jackson, his wife Heidi and business partner Ian Olsen, have expanded their empire with 13 Lemonade restaurants and are working to open others in Southern California. Raising three children and working full time, this entrepreneurial couple longed for a neighborhood café that they could take the kids for a quick, fresh and healthy meal. They brainstormed and thought up the concept of Lemonade. Of course, they sell eight different types of lemonade, from old-fashioned, to cucumber mint and blueberry mint to pair with their healthy dining fare. 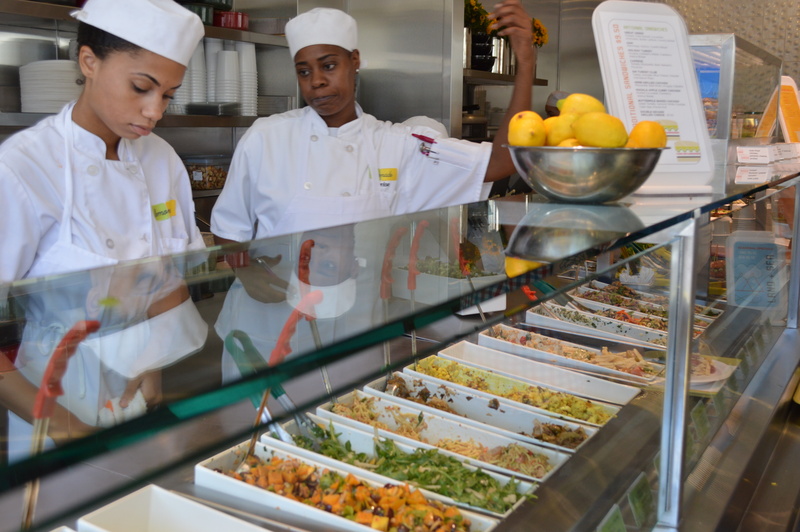 Individuals and families grab a tray and peruse the rotating marketplace vegetables offering salads without lettuce. Alan doesn’t have a problem with lettuce, it just seems like filler. People rarely eat all of the lettuce, but they do dig into the robust flavors of chopped vegetables, pungent cheese and toasted nuts. The exception is Alan’s arugula, fig and blue cheese salad. The arugula gives the sharp blue cheese in this dish a nice peppery zip. Most of the 16 to 20 marketplace items are healthy and vegetarian. Guests may choose up to six items for a light lunch, mid afternoon pick-me-up snack or fulfilling dinner. The multicolored display entices children to try a new array of vegetables such as the zesty Brussels sprouts dressed in sherry vinaigrette and the cauliflower tossed with a mild curry. For those who are looking for heartier fare, they offer protein dishes such as Ahi tuna with snap peas, smoked salmon, a variety of chicken dishes, skirt steak with balsamic Bermuda onions, and a Chinese-style braised duck with chard, pineapple, and cashews. In the braised meat area, try the beef short ribs that have been cooked for hours, or the BBQ brisket. Both are tender and savory. Some days they serve a lamb tagine with figs, apricots and almonds and a roast turkey with dried cranberries and sage gravy. Looking for a tasty sandwich? 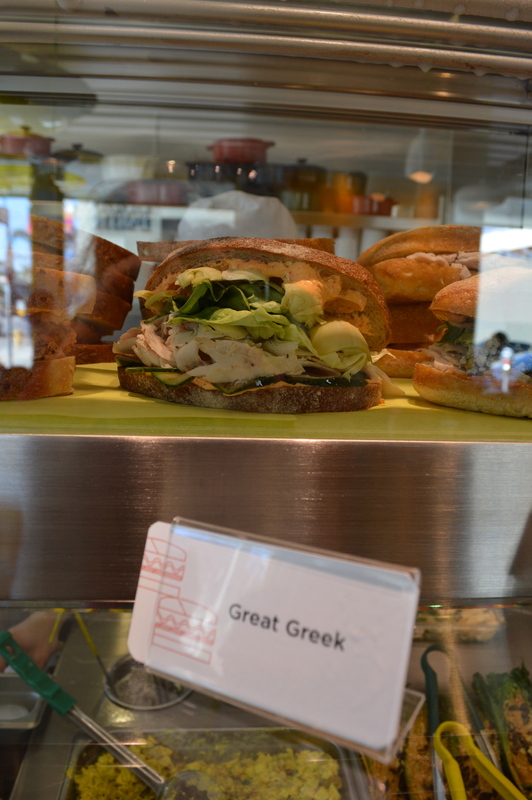 Lemonade has at least eight different types of sandwiches that include a Caesar club and a buttermilk-baked chicken with Vidalia onion and bacon cabbage on a pretzel roll. 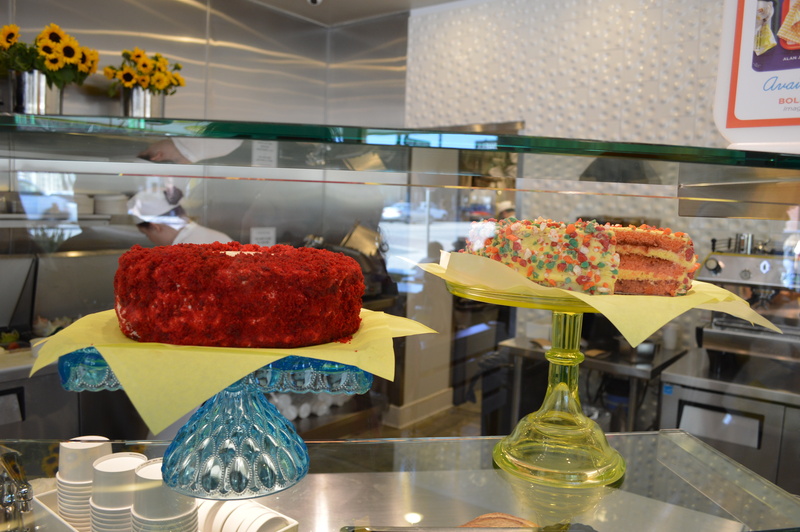 Near the cashier is a tempting display case showcasing large classic chocolate chip cookies, and slices of various cakes, including a vibrant red velvet cake. While enjoying lunch at the new Studio City location, my friend presented me with a copy of The Lemonade cookbook. Jackson co-wrote the appealing picture book with over 120 recipes, with producer and author JoAnn Cianciulli. Many of the dishes I enjoyed at the restaurant are featured in the book. 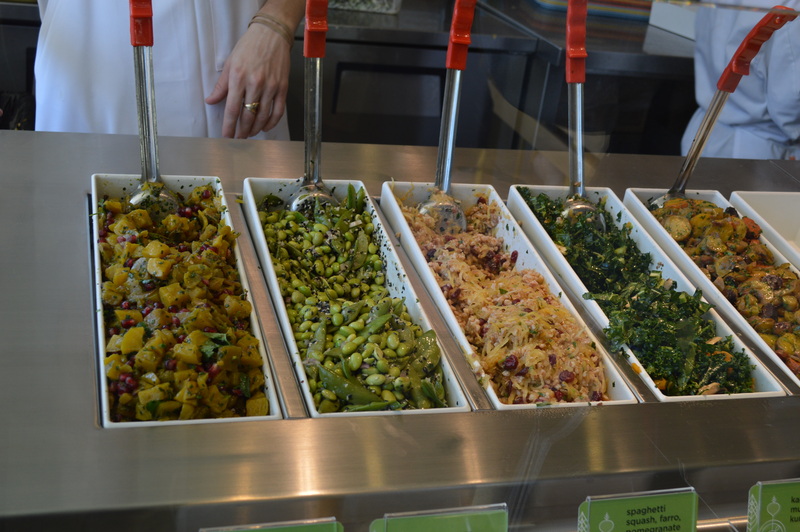 I especially like that they included most of the dressings featured in many of the marketplace vegetable salads. Jackson has a kind heart and generously gives back to those in need by donating 5 percent of the proceeds from the sale of each cookbook to The Painted Turtle. It’s a non-profit organization dedicated to providing life-changing camp experiences for children with serious medical issues. During National Lemonade Day last August, he donated all of the proceeds from the sales of his lemonade beverage from each café to this organization. Next time you need your thirst and appetite quenched, visit a Lemonade modern café. 626 N. Larchmont Blvd. (323)464-0700, 9001 Beverly Blvd. (310)247-2500 and 505 S. Flower St. (213)488-0299. To find other locations, go to http://www.lemonadela.com. Next Post Spring Break in Washington D.C.